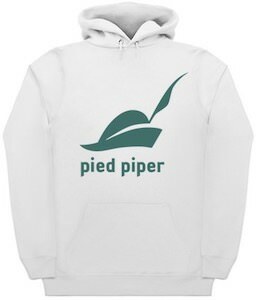 Silicon Valley fans can now enjoy a Pied Piper Hoodie. This Silicon Valley hoodie is white and made from 90% cotton and 10% polyester and comes in sizes Small – 2XL and it will look great on both men and women. You can choose for a sweater style hoodie or a zip up one and you can even choose to have the Pied Piper design on the front or the back of the hoodie. On the hoodie you can see in green the the green hat of the Pied Piper and below it the company name from Jared and the others. This is just a fun hoodie that is even great for people that never even heard of the Silicon Valley TV series.